The topic of the annual “Ratzinger Schulerkreis,” in which Pope Benedict meets with his former doctoral students has been announced. Participants will gather in Castelgandolfo from August 27 to August 30 to discuss the theme of the mission of the Church. In recent years, the Pontiff and former students from Tubingen and Regensburg, who include Cardinal Christoph Schoenborn of Vienna and Father Joseph Fessio of Ignatius Press, have discussed evolution and Islam. Since CASH FOR CLUNKERS has been so successful, Obama thinks it is now time . .
. . . to implement GOLD FOR GRANNY! First, what does abortion have to do with healthcare? Historically and morally healthcare has to do with protecting health? Abortion is the extinction of a human life! That is not healthcare — it is murder! Second, Bravo Cardinal Rigali! In the news today . 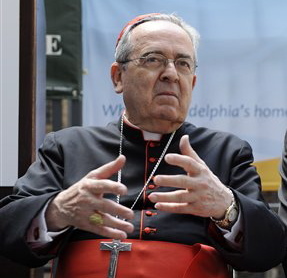 . .
Cardinal Justin Rigali of Philadelphia, the chairman of the US bishops’ pro-life committee, has written to members of the House of Representatives to say that current health-care reform legislation is “seriously deficient” insofar as it includes taxpayer-funded abortion coverage. The cardinal pointed out that the legislation now pending before the House is a “radical change” from the federal policy that respects the consciences of abortion opponents and does not include tax-subsidized coverage for voluntary abortion.